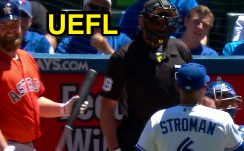 Blue Jays pitcher Marcus Stroman's odd delivery and HP Umpire Paul Nauert's "Time" call produced an argument from Stroman when he felt the umpire improperly called "Time" after Stroman had come set. The Play: With one out and none on in the top of the 4th inning of Saturday's Astros-Blue Jays game, Astros batter Brian McCann prepared to face Stroman's 0-1 pitch. As Stroman prepared to deliver the ball toward home plate, McCann requested "Time" from plate umpire Nauert, which was granted, resulting in Stroman's passionate objection as he walked off the mound to address Nauert, who took up the discussion with Manager John Gibbons. 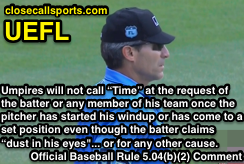 The Rules: Official Baseball Rule 5.04(b)(2) Comment states, "Umpires will not call 'Time' at the request of the batter or any member of his team once the pitcher has started his windup or has come to a set position even though the batter claims 'dust in his eyes,' 'steamed glasses,' 'didn’t get the sign' or for any other cause." For an example of an umpire properly refusing to grant "Time" after a pitcher has started his windup, see Todd Tichenor - Jonny Gomes (time out request refusal), 7/14/13. 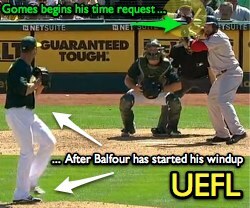 For one of the reasons this rule exists, see "Cueto Injury and Why Ump Did Not Grant Time." "Time" is denied after the pitcher winds up. OBR 5.07(a) specifies two legal pitching positions, the Windup Position and Set Position. As Stroman selected the Set Position, we shall cite Set Position Rule 5.07(a)(2): "Set Position shall be indicated by the pitcher when he stands facing the batter with his pivot foot in contact with, and his other foot in front of, the pitcher’s plate, holding the ball in both hands in front of his body and coming to a complete stop...After assuming Set Position, any natural motion associated with his delivery of the ball to the batter commits him to the pitch without alteration or interruption." (1) Stroman raises his left leg (lead leg), which is a natural motion associated with his delivery. (2) Stroman returns his left leg to the ground, but fails to pitch the ball. (3) Batter McCann requests, and is granted, "Time." (4) Stroman again raises his left leg, but this time, attempts to deliver a pitch as Nauert signals "Time." Stroman tried to double-dip before "Time." Had there been baserunners, Stroman's actions would have constituted a balk, specifically a Rule 6.02(a)(1) violation, also known as a Start-Stop balk: "If there is a runner, or runners, it is a balk when—The pitcher, while touching his plate, makes any motion naturally associated with his pitch and fails to make such delivery." As it were, Stroman's start-stop action (numbers (1) and (2)), on its own, carries a "no harm, no foul" connotation with the bases empty: the pitcher can simply step off, reset, and re-engage with no additional penalty. However, and depending on your evaluation of Stroman's first step (as specified by sequential numbers (1) and (2), above), Stroman might have even been guilty of an illegal pitch when he attempted to fast-track his interrupted delivery via phase (4), and pursuant to Rule 5.07(a) Comment, which states, "The pitcher may not take a second step toward home plate with either foot or otherwise reset his pivot foot in his delivery of the pitch. If there is a runner, or runners, on base it is a balk under Rule 6.02(a); if the bases are unoccupied it is an illegal pitch under Rule 6.02(b)." Graphic of Rule 5.04(b)(2) Comment. Although a batter may not request "Time" after a pitcher begins his windup or enters Set Position, the pitcher in this play violated Set Position Rule 5.07(a)(2) by failing to pitch to the batter when committed: he improperly started his delivery, only to stop it prematurely. To take a spirit-of-the-rule glance at this play, consider another portion of Rule 5.04(b)(2) Comment: "If after the pitcher starts his windup or comes to a 'set position' with a runner on, he does not go through with his pitch because the batter has inadvertently caused the pitcher to interrupt his delivery, it shall not be called a balk. Both the pitcher and batter have violated a rule and the umpire shall call time and both the batter and pitcher start over from 'scratch.'" Although this is a bases-empty situation, the sentence that translates is, "Both the pitcher and batter have violated a rule and the umpire shall call time and both the batter and pitcher start over from 'scratch.'" Thus, if Stroman violated by failing to pitch without alteration or interruption and McCann violated by requesting "Time" after Stroman came set, we have a reset/start over from scratch situation. Even though failing to pitch when committed is not a balk with the bases empty, it nonetheless is a violation of the Set Position rule. The fact that Stroman attempted to save his delivery faux pas—as specified by number (4) in the sequence—does not rectify the fact that he attempted to make an illegal pitch, and the batter was well within his right to request, and receive, "Time" due to the pitcher's illegal action based on the aforementioned rules.